After some movement in Congress in 2013, and then a stall, there are signs that immigration reform might move ahead in 2014. House Speaker John Boehner has indicated a new willingness to bring discussion about immigration reform to the House floor, and House Republicans are expected to issue specific proposals for changing the nation’s immigration laws in the coming weeks. One sticking point has been what to do with the nation’s 11.7 million unauthorized immigrants. Should there be a path to citizenship for them or should they be offered a chance to remain in the country legally, but without a special path to citizenship? Just last year, the U.S. Senate passed a comprehensive immigration bill that included the possibility of citizenship with a 13-year waiting period for those who meet certain requirements, such as satisfying any applicable federal tax liability and learning English. It remains to be seen if House Republicans will include something similar in their immigration reform plans or if those plans will offer some other form of legalization for unauthorized immigrants. At the same time, deportations of unauthorized immigrants have continued at near record levels. In fiscal year 2013, 368,644 immigrants were deported. That is down from the nearly 400,000 deported annually during the first term of the Obama administration, but remains above the level of deportations that occurred annually during the eight years of the Bush administration. With most of those deported—more than 95%—from Latin America, the threat of deportation looms large for the Hispanic community. According to a fall 2013 Pew Research Center survey of Hispanic adults, 46% of all Hispanics, and 59% of Hispanic immigrants, say they worry “a lot” or “some” that they themselves, a family member or a close friend could be deported. Hispanics alone comprise about three-fourths of all immigrants living in the U.S. illegally. While Asian Americans make up a much smaller share of unauthorized immigrants than Hispanics, a greater share of Asian American adults are foreign born—74% versus 51%. Today, new immigrants from Asia are eclipsing new immigrants from Latin America, making the topic of immigration reform an important one to the Asian-American community as well. According to the survey of Hispanics, most U.S. Hispanics would prioritize, by 55% to 35%, relief from deportation over a pathway to citizenship for unauthorized immigrants. A similar survey of Asian-American adults fielded in October finds that U.S. Asians tilt in the same direction, though by a much narrower margin—49% to 44%. This is not to say that a pathway to citizenship is not supported by Hispanics and Asian Americans. Fully 89% of Hispanics and 72% of Asian Americans support a pathway to citizenship for unauthorized immigrants if they meet certain requirements. However, both surveys also show that when dealing with the issue of unauthorized immigration, being able to live and work in the U.S. legally without the threat of deportation is more important than a new government plan to obtain citizenship. This may reflect a possible opening for legislative compromise on immigration reform. 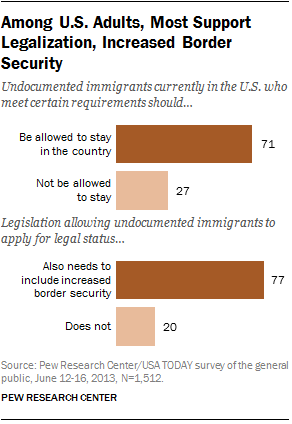 The U.S. general public is also supportive of allowing unauthorized immigrants to remain in the country legally. A Pew Research Center/USA TODAY survey from last June found that 71% of U.S. adults said there should be a way for undocumented immigrants to stay in the country legally, if they meet certain requirements (a different survey question than that asked of Hispanics and Asian Americans). Support for legalization crosses party lines—majorities of Democrats (80%) and Republicans (61%) said they support this measure. The same survey found that most Americans believe legalization should be tied to improved border security—fully 77% said this. But the public was divided when it came to the timing of this link. Some 43% of U.S. adults said legalization should occur only after the effective control of U.S. borders is achieved, but half (49%) said unauthorized immigrants should be allowed to apply for legal status while border improvements are being made. Asian Americans and Hispanics also support increased border security. When asked as part of a list of possible immigration policy proposals, 73% of Asian Americans and 68% of Hispanics say they approve of increasing enforcement of immigration laws at U.S. borders.